"I think that if there are ghosts anywhere, you'd expect to find them at Eastern." The haunted prison known as Eastern State Penitentiary is located in Philadelphia, Pennsylvania. This structure is not only known as the country’s first official penitentiary, but also for the true haunting stories that surround it. The structure officially opened in the year of 1829. Given the fact that it was the first structure to offer placement of criminals, it served as a guide for all future penitentiaries and similar holding facilities such as correctional units and jails. 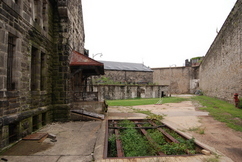 Prior to the development of Eastern State Penitentiary, criminals were held in overcrowded pens that were enclosed by heavy fencing and gates. While the structure was considered to be revolutionary in its time, it would eventually gain popularity as being a place where the signs of paranormal activity abounded. Throughout this guide, you will learn why Eastern State Penitentiary is considered to be one of the most haunted places in America. The Eastern State Penitentiary was part of a movement that was considered to be highly controversial at the time. Its purpose and intent was to modify the behaviors of the individuals that served as inmates there through solitary confinement and various types of labor. While it is considered to be the first official penitentiary located throughout the world, this haunted prison was not the only penitentiary of the time. Another facility, known as the “Walnut Street Jail” was officially opened in the year of 1776. By the time 1790 rolled around, many were calling the facility a “Penitentiary”. This reference is officially derived from the word “Penitence”. At the time, this haunted prison offered a type of incarceration that was termed “Revolutionary” because of the fact that it encouraged the solitary confinement of each inmate as a unique way of rehabilitating the individual. Many refer to this type of incarceration as the “Pennsylvania System”. 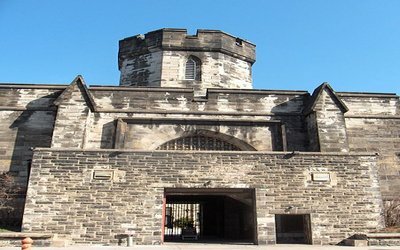 It was in the year of 1821 that the Legislature in Pennsylvania approved funds for the Eastern State Penitentiary to be constructed. Based on the original plans, the newly formed prison would house up to two hundred fifty inmates. Four different people that worked in architecture submitted unique sketches and designs for the facility. The design that finally got selected was submitted by an individual named John Haviland. While a man by the name of William Strickland was initially appointed to oversee all of the construction on the prison, he was removed from the position in the year of 1822 and John Haviland was hired to take his place given the fact that it was his design chosen and he had a high level of experience in architecture. In the year of 1829, the legislation of the state that specifically addressed the concepts of solitary confinement and labor was officially passed. The leaders of the day held heavily to the notion that most crime that occurred was a direct result of the perpetrators environment. They believed that if the person was confined in an isolated manner that they would eventually become regretful of their mistakes. The haunted prison was designed to ensure that the prisoners held captive in the facility would not have any type of contact with others that were held captive. Each cell was carefully designed so that it had a unique food door and its own exercise yard. It is no wonder with the isolation and detachment that each prisoner experienced at Eastern State Penitentiary that the signs of paranormal activity abound and it is considered to be one of the most haunted places in America. •	Joe Buzzard – This inmate was part of the Buzzard family – which consisted of five brothers. All of the brothers served time at the haunted prison. He was the youngest of the family and was eventually convicted of stealing horses. While horse theft was once considered to be the main crime inmates were convicted of, by the time that this inmate arrived in the year of 1939, he was the only horse thief that remained. His brothers were named Jacob, Abe, Ike and Martin. •	Al Capone A.K.A “Scarface” – This inmate has been considered the most famous mob boss located in Chicago all throughout history. In the years of 1929 and 1930, Al Capone spent a total of eight months confined to Eastern State Penitentiary. The first conviction that he had resulted in carrying a deadly weapon in a concealed manner. He was placed on what is often identified as the “Park Avenue Block” – which was designated for those with money and notoriety. 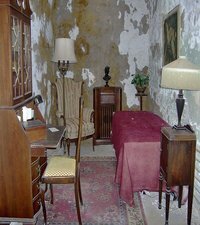 His cell included the finest furniture, a special cabinet radio, exquisite rugs and a wide array of other luxury items. •	William Sutton – Throughout all of American history, William Sutton – also known as “Slick Willie” – was considered to be the most famous bank robber. He resided at Eastern State Penitentiary for eleven years. In the year of 1945, he tried to escape the facility with numerous other inmates through a tunnel that was approximately one hundred feet in length. However, he did not get very far before getting caught. Many people throughout history claim that there are numerous signs of paranormal activity at the haunted prison. Hundreds have true haunting tales and experiences. The true haunting stories of the haunted prison date back to the 1940s when both guards and individuals confined in the facility claim that they have experienced unexplained visions and a wide array of unusual experiences. When Eastern State Penitentiary was officially abandoned in the year of 1971, the true haunting stories and rumors of the unexplained haunted prison seemed to increase dramatically. Given the amount of isolation that the souls confined to the structure endured as well as the fact that they had to wear black hoods to cover their faces when moved from one location to another, it is not at all surprising that the structure is considered to be one of the most haunted places in America. 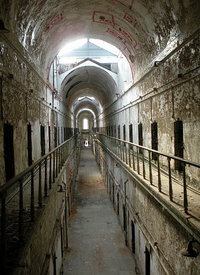 One of the most popular ghost stories associated with this haunted prison includes the catwalk section of the facility. On the popular “Ghost Hunters” TV show, a shadow figure was caught on video in this region. Many visitors to the haunted prison have reported many different signs of paranormal activity in this location. Not only have visitors felt extreme temperature fluctuations, but they have also witnessed shadowy figures and captured amazing EVPs on the catwalk. One guest reports capturing an EVP where a male voice stated: “I’m lonely”. If you are interested in visiting one of the most haunted places in America, the catwalk at Eastern State Penitentiary seems to be a location where you are sure to capture a glimpse or a voice of a paranormal entity. There is a very intriguing true haunting story surrounding Al Capone when he was confined at the haunted prison. He insisted that he was being tortured by a man named James Clark, who was killed in the event known as the “St. Valentine’s Day Massacre”. Each night, it was said that Capone would scream in fright. He was reported in screaming at a man who he referred to as “Jimmy”. He would beg and plead for the man to go away and leave him alone. Yet, night after night, the spirit of James Clark would evidently return to torture Capone for the rival against his brother-in-law. Despite the fact that the guards consistently checked in and around Al Capone’s cell, they were never able to identify anyone or anything – despite the claims that Al presented. However, Al Capone seemed to hold a high level of intelligence and he was apparently shook up by the signs of paranormal activity that plagued him. Many individuals that have worked in or explored the area known as “Cellblock 12” – which was a restricted location within the facility – have claimed that they have experienced true haunting events in the area. Other blocks such as “4” and “6” have also been associated with signs of paranormal activity. Many individuals claim that they have seen shadowy figures moving in and out of the areas. Others have expounded on the fact that they have heard whispers, screams, and laughter in these locations. In addition to these occurrences, many claim that as they walked through the facility, they experienced the sensation that they were being watched by an unidentified entity. One of the most popular true haunting stories of the haunted prison involved a man by the name of Gary Johnson. He was a locksmith who was performing restoration work to the facility. He felt uneasy and turned around to see a black shadow jump from one cell into another. If you have an interest in visiting one of the most haunted places in America, the haunted prison known as Eastern State Penitentiary is sure to pique your interest. There are many ghost tours and related events hosted at the facility. It is important to understand that the signs of paranormal activity may not be appropriate for the faint of heart. However, if you are truly interested in the paranormal, this is one of the most interesting and promising haunted places to go. Click on the video screen to see a short documentary on Eastern State.